This is one of those Hindi flicks that win awards but get lost in the commercial clutter of Bollywood. A beautiful movie about a doctor who does not do too well in med school, but becomes a researcher who finds a cure for leprosy that is ‘suspected’ to have a curious but positive side-effect: it makes women fertile. This becomes a serious issue, and he is brought down methodically by the jealous medical establishment. Pankaj Kapur plays the lead with Shabana Azmi in this 1990 film directed by Tapan Sinha. Simply beautiful! Based on Ed Rosenbaum’s book ‘A Taste of My Own Medicine’, this is a beautiful depiction of the humbling of an arrogant surgeon who develops throat cancer. As he does what patients have to do – go to clinics, take tests, meet doctors – he begins to see medicine beyond procedures and prescription. A relationship he develops with another cancer patient is truly poignant. Directed by Randa Haines, the lead role is played true to form by William Hurt. This movie will bring a smile on your face every time you watch it. It will also bring out a tear. It is entertaining and insightful. 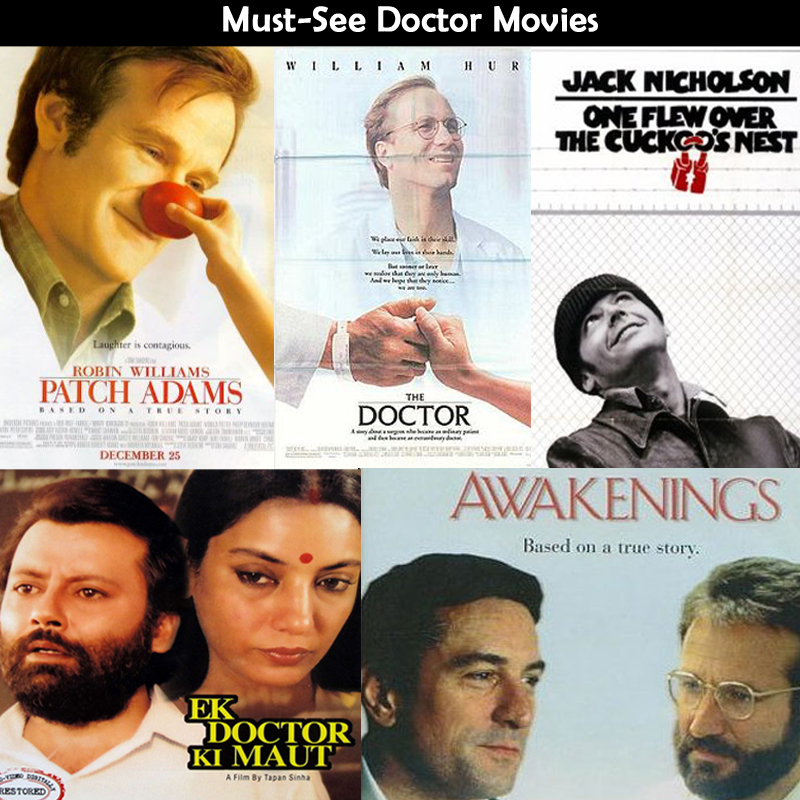 Based on the life of Hunter ‘Patch’ Adams, Robin William plays the lead, who is addressed as Patch. Patch decides to be a doctor with a difference after being in a pyschiatric ward. His ideas clash with the traditional bastions of medicine, but he soldiers on and establishes the Gesundheit Insititute, a low-cost hospital that lays stress on the emotional needs of patients and, most importantly, on the power of smiles. This is a critical look at what dehumanising of medicine does to patients and how Patch fights it. This Tom Shadyac flick from 1998 is the perfect dose of fun. This film is a must-watch for medical students, doctors, medical educators and anyone interested in how underprivileged talent shines through, and is eventually acknowleged by everyone. A 2004 Joseph Sargent HBO film, it’s a story of a relationship between a wealthy white heart surgeon, Alfred Blalock, essayed by Alan Rickman, and a black, poor carpenter Vivien Thomas, played by Mos Def. The two come together to invent a new technique for performing heart surgery on “blue babies” in Baltimore in the 1940s. While this one is not exactly a film about doctors, it gives great insight into the meaning of freedom and rebellion in the classiest way possible. Many of you will ‘recognise’ the hard-nosed dictatorial ‘villian’ of the film, who is interestingly called Nurse Ratched. Directed by Milos Forman, this 1975 movie is based on the Ken Kesey novel of the same name. The lead is played by Jack Nicholson, in his trademark inimitable style. This one is a true blue classic. Based on a W Somerset Maugham novel, this 2006 movie is set in China in 1925. It is about the marriage of a young London socialite and a bacteriologist living in Shanghai. After the wife is discovered to have had an affair, the couple moves to a remote village, where amid poverty and disease they find new purpose and forgiveness. Another entertaining film starring Robin Williams and Robert de Niro. Robin Williams, a researcher, uses an experimental drug (L-dopa) to “awaken” patients who have been catatonic for decades after an encephalitis epidemic. And guess what, Robert de Niro plays the patient who awakens and becomes aware of life in a new time and place, but goes back to his catatonic state eventually. It portrays the excitement and the heartbreak of clinical research. This humorous Mike Nichols HBO film from 2001 stars ace actor Emma Thompson, who plays an intimidating but witty English professor who is diagnosed with terminal ovarian cancer. As she goes through the entire spectrum of experimental treatment, her reflections on her condition and the care-givers around her, are somethings that will leave you around a halo of sad-happy wisdom. Based on Joseph Heller’s book Catch-22, this is medical funny at its best. A true laugh riot classic. This is one monster of a film that depicts how a doctor gets entwined in the political machinations of the notorious dictator Idi Amin. Forest Whitaker got an Oscar for his chilling portrayal of the dictator and James McAvoy’s role as the young doctor is memorable. Don’t miss out Kerry Washington, who plays the seductive wife of Amin. Starring a battery of Hollywood superstars, this 2011 film will chill you with the scenario a probable outbreak of a superbug. This is the ultimate virus epidemic movie, and gives an insight into the ‘future flu’ that could spell doomsday. ….The list is long. Is there any doctor movie you would like to recommend? Write to us in the comment box below.